The automotive sector is one of the richest targets for emerging innovations in Cyber Physical Systems (CPS). Our Research Laboratory has focused for the past ten years on advanced automotive safety systems. The current research agenda is on robust certification of advanced autonomous and semi-autonomy systems. Instead of totally disconnecting the driver from the vehicle, as in autonomous cars, we envision a vehicle where the degree of autonomy is continuously changed in real-time as a function of certified uncertainty ranges in driver behavior and environmental uncertainties. The degree of autonomy is chosen among a continuum of options between the driver in total control of the vehicle and autonomous driving, depending on the trust level in the CPS. This human-centric autonomy has a high probability of societal impact (insurance policy will be the same if not lower, system will cost less and the market penetration higher). It will also have a direct impact on a large number of CPS with humans in the loop, which do require robustness certificates. With this in mind, we propose a paradigm shift which looks at the whole cyber physical vehicle/environment/driver and thus addresses all its three main critical components: (A) the vehicle/environment interaction, (B) the driver uncertainty and (C) the provably-safe intervention under the predicted uncertainty of A and B. At Berkeley we are developing a novel science for Cyber-Physical Systems with the goal of obtaining a provably safe human-centric autonomy where certification is evidence-base and evolves with the system (as new driver behaviors, scenes, slipping dynamics are updated in the CPS database). Robustness is measured against bounded state-dependent uncertainty quantified from developed driver/vehicle/environment interaction models, calibrated and validated on large data set and updated in real-time. This project focuses on the formal design of semi-autonomous automotive Cyber Physical Systems (CPS). Rather than disconnecting the driver from the vehicle, the goal is to obtain a vehicle where the degree of autonomy is continuously changed in real-time as a function of certified uncertainty ranges for driver behavior and environment reconstruction. The highly integrated research plan will advance the science and engineering for CPS by developing methods for (1) reconstructing 3D scenes which incorporate high-level topological and low-level metric information, (2) extracting driver behavioral models from large datasets using geometry, reasoning and inferences, (3) designing provably-safe control schemes which trade-off real-time feasibility and conservatism by using the evidence collected during actual driving. Assisting humans in controlling complex and safety-critical systems is a global challenge. In order to improve the safety of human-operated CPS we need to provide guarantees in the reconstruction of the environment where the humans and the CPS operate, and to develop control systems that use predictive cognitive models of the human when interacting with the CPS. A successful and integrated research in both areas will impact not only the automotive sector but many other human-operated systems. These include telesurgery, homeland security, assisted rehabilitation, power networks, environmental monitoring, and all transportation CPS. Graduate, undergraduate and underrepresented engineering students will benefit through classroom instruction, involvement in the research and a continuous interaction with industrial partners who are leaders in the field of assisted driving. Through the Hyundai Center of Excellence, UC Berkeley will provide world-class academic training to Hyundai Motor Company (HMC) engineers in the effort to enhance HMC’s capabilities and expertise in the area of Integrated Vehicle Safety Systems & Control. We will also initiate long-term collaborative research projects in advanced topics already identified by HMC and UC Berkeley representatives. The center will allow UC Berkeley researchers and HMC engineers to work together on the ultimate goal of defining, desiging and developing the next generation of active safety control systems. We have started a joint project in collaboration with Volvo Car on real-time active safety. Students from our group are working with visiting scholars from Volvo to develop a framework for active safety that includes driver model predictions as well as stability and lane-keeping control. Experimental tests have been conducted at Volvo in Gothenburg, Sweden on a passenger vehicle. 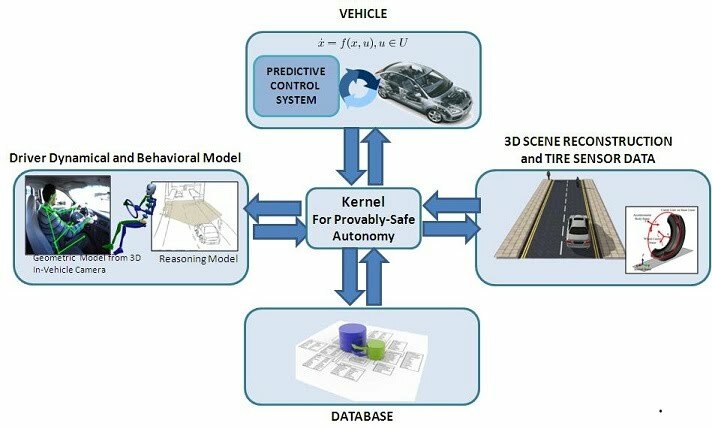 The collaboration has yielded interesting new approaches to real-time model predictive control for active safety. Recent collaborations between our group and the engineers at Ford Research Labs have proven a successful development and experimental validation of Nonlinear and Linear Time Varying MPC schemes for active steering and combined braking and steering. Such research represents the state-of-the-art design and implementation of a real-time constrained predictive control in the automotive field. The objective of this research is to study the formal design and verification of advanced vehicle dynamics control systems. The approach is to consider the vehicle/driver/road system as a Cyber Physical System (CPS) by focusing on three critical components: (A) the tyre/road interaction, (B) the driver/vehicle interaction and (C) the controller design and validation. Methods for quantifying and estimating the uncertainty of the road friction coefficient by using self-powered wireless sensors embedded in the tire will be developed for component (A). Tools for real-time identification of nominal driver behavior and uncertainty bounds by using in-vehicle cameras and body wireless sensors will be developed for component (B). A predictive hybrid supervisory control scheme will guarantee that the vehicle performs safely for all possible uncertainty levels. In particular, in component (C), the CPS autonomy level will be continuously adapted as a function of human and environment conditions and their uncertainty bounds quantified by components (A) and (B). High confidence is critical in all human operated/supervised cyber physical systems. These include environmental monitoring, telesurgery, power networks and any transportation CPS. When human and environment uncertainty bounds can be predicted, safety can be robustly guaranteed by a proper controller design and validation. This avoids lengthy and expensive trial and error design procedures and drastically increases their confidence level. With the described trend in sensors and actuators infrastructure, it comes natural to ask what is the optimum way for controlling the vehicle maneuver in a given obstacle avoidance situation. Our research focuses on formal methods for designing advanced autonomous guidance system. In particular, together with the Ford Research Laboratories in Dearborn, USA, we are applying the Explicit MPC algorithms and Nonlinear Constrained Optimal Control theory to several advanced vehicle dynamics control problems. We have successfully applied MPC strategies for the development of active steering controllers. Road tests on a Jaguar vehicle have shown that MPC keeps the vehicle on the desired track despite slippery road conditions and high vehicle speeds. It has been shown that MPC can stabilize the vehicle travelling at high speeds on icy roads. Under the same conditions, any controller designed with traditional methods does not succeed in stabilizing the vehicle. To the best of our knowledge, for the first time a nonlinear MPC scheme has been implemented on a dSPACE rapid prototyping system to control the vehicle dynamics of an autonomous passenger car with a sampling frequency of 20 Hz. The objective of this research is to study methods for increasing fuel economy using traffic data and a model predictive controller. Using knowledge of the traffic ahead, a vehicle can react to changes in traffic density or speed before they happen, increasing the efficiency of a trip and providing valuable information to the driver. In particular, the traffic information is used to determine a time-varying velocity envelope that the vehicle must satisfy. Then, a vehicle model is used to compute the vehicle speed profile that minimizes fuel use and satisfies the velocity constraints. Simulation and experimental results have shows the feasibility of the proposed approach on a passenger vehicle with minor hardware modifications required for its implementation. Autonomous drive at 60Kph on Ice by using MPC. Controlling differential braking and steering. Model predictive control is used to follow the path of an expert driver. The maneuver consists of bringing the vehicle into a drift and completing a 180 degree turn on ice.